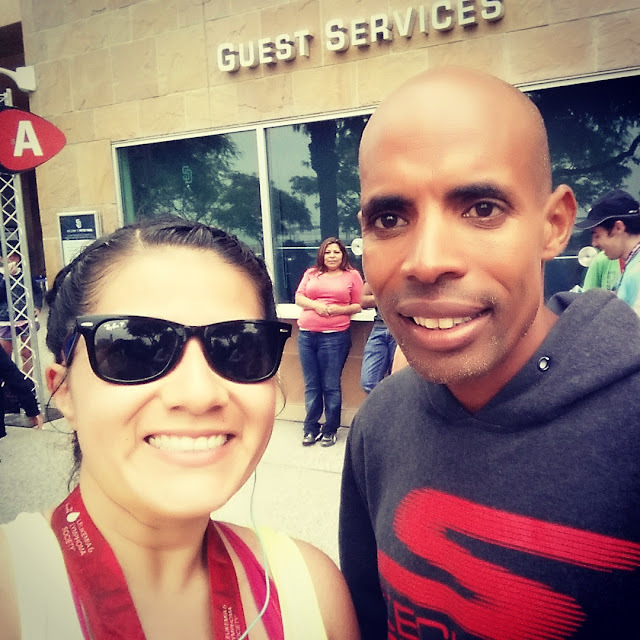 Fit Wanderlust Runner: I MET MEB!! I can die happy now. 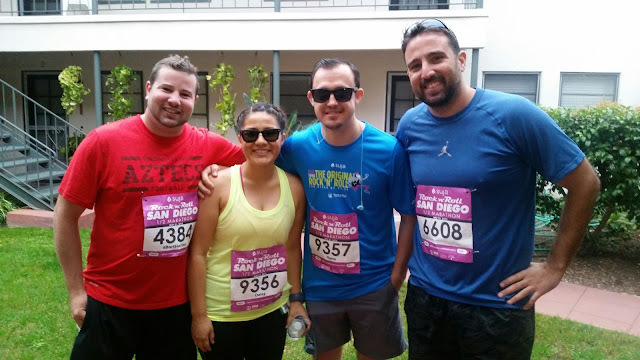 I have been meaning to blog about my race recap from last Sunday, but a few things came up. For starters I didn't have any Internet for a few days which makes blogging a bit difficult. The reason why is becuase we moved into our new house!! Which leads to the second reason...we have been moving in and it has taken up a lot of our time this week. Let me tell you it is not a pretty picture seeing two VERY sore runners trying to move. Actually it is pretty comical. 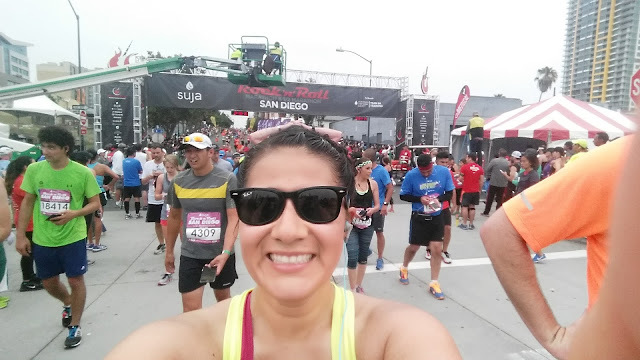 I am still recovering from my race but overall I still feel great. I survived yet another SD Rock N Roll race. 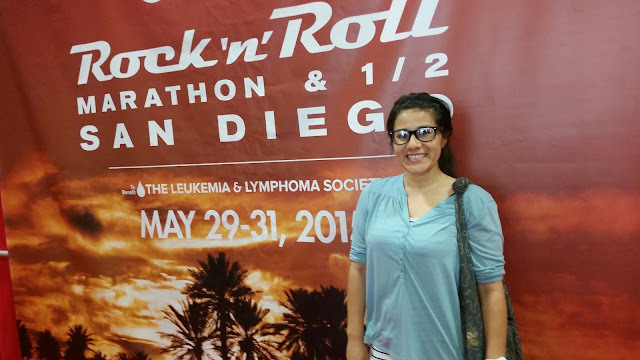 We were already in Downtown San Diego on Friday before the race, so we decided to just hit up the convention center and pick up our packets. Since we had a limited amount of time to browse around I had to quickly get our packets and head out. The Rock N Roll Expos are probably some of my favorite to attend. 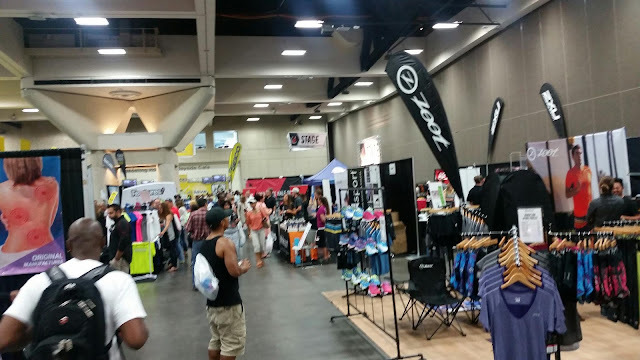 They have a whole bunch of vendors to choose from, really cool activities to do, and great guest speakers to listen to. 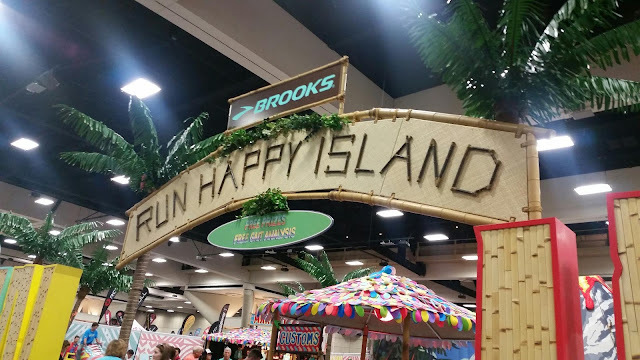 Since one of the main sponsors for the race is Brooks (which just so happens to be my current running shoe brand of choice) they had a really cool section of clothes, shoes, and activities to do. Also, they raise a lot of money for Cancer reasearch and this year they had a really cool feautre where you could make a sign in memory of a loved on who passed. During the race they posted the sign and it was a great way to motivate you towards the end. When I was running I read a few of the posters and it really got me emotional. Made me think of my beautiful niece who died of lymphoma two years. 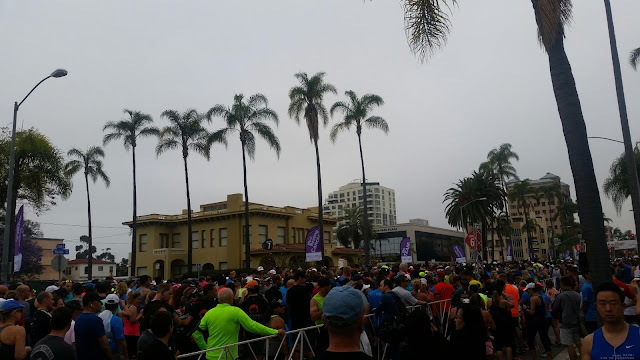 Our friend's mother was gracious enough to pick me and my husband up and drop us off close to the race start. Our friend Adam's girlfriend lived right where the start started so we finished getting ready over there. Of course the nerves started to sink in but we still had enough time to get some selfies and group pictures. 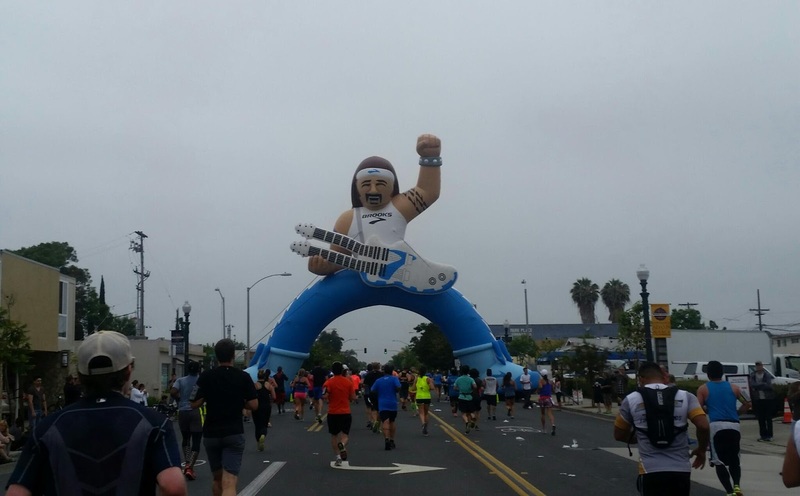 For the last three years we have been running at different Rock N Roll races across the US. We have one more lined up for the end of the year in San Antonio. Luckily we have a hook up that gets us in for free! Unfortunately we no longer get VIP but we still always have a great time. For the most part they have bagels, bananas and water at the start line for runners. I wasn't able to get a banana though. They were all gone by the time we finally got there. The full marathon started before the half so some stuff was already gone. The bathroom lines were long as usual. I feel like they keep adding more bathrooms every year but there is still never enough. Luckily since we got ready at our friend's place so we had our own personal bathroom. Before we knew it was time to start! Okay I felt pretty awesome for the first eight miles. The first two miles I was pretty slow but just feeling the course out. After I realized I could keep about a 9:30 pace then I got a steady groove. Unfortunately on mile eight some rolling hills came along that I just couldn't tackle. I had to walk and then my pace started to slow down. 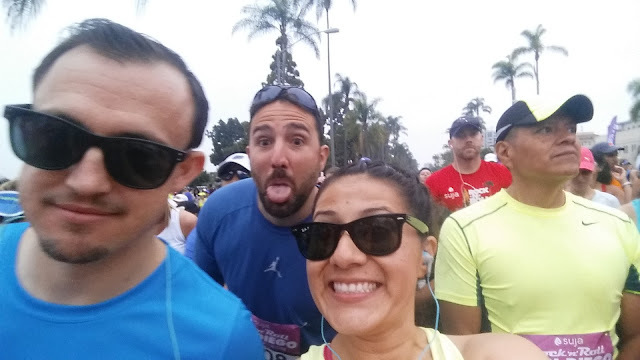 The people throughout the course were awesome though. They pushed me to keep going even when I felt I couldn't. Of course there were different neighborhoods that had tequila stations, bloody mary stations, donuts, whiskey bars, orange slices, and of course the regular water/Gatorade provided by the actual event. Bands were performing in just about every mile and of course there were different high school cheerleaders throughout the course cheering us on. Sadly I only took one picture during the entire course. 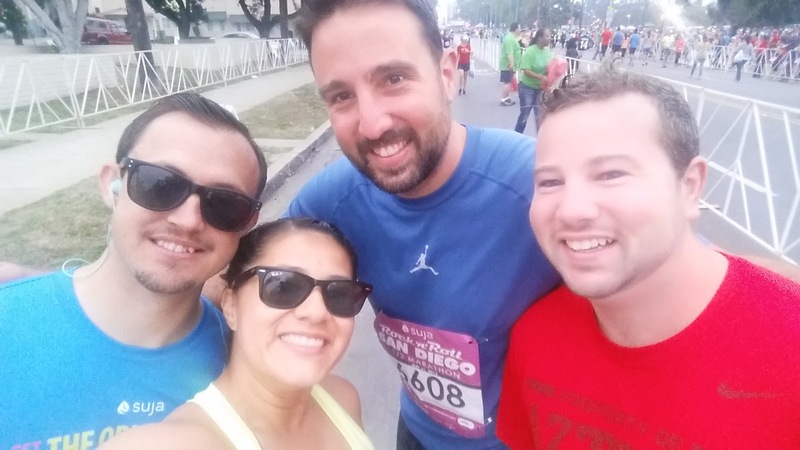 The four of us ran together at the beginning but all broke away after the first mile. My husband came in first (of course) and I came in second. I was hoping to get 2:05 but I ended up with 2:06. No PR for me but I new that was not going to happen. Overall it was a great race. Not only did I feel great with no pain, but I got to meet my idol!! Yes I met the one and only, MEB! After the finish line, I headed over to Petco Park where the beer garden was at. On my way to the entrance I saw a really small group of people taking pictures with someone. I took a better look and realized it was Meb!! Of course I walked over there and had to take a quick selfie. He was so sweet and asked me how my race went. I missed an opportunity last year to meet him, so I was ecstatic that I finally got to meet him. I am still reading his book but I love it so far. After meeting him I was pretty much on cloud nine! My husband was happy for me since he knows how much I look up to him. Every runner (over 21) received a free beer. 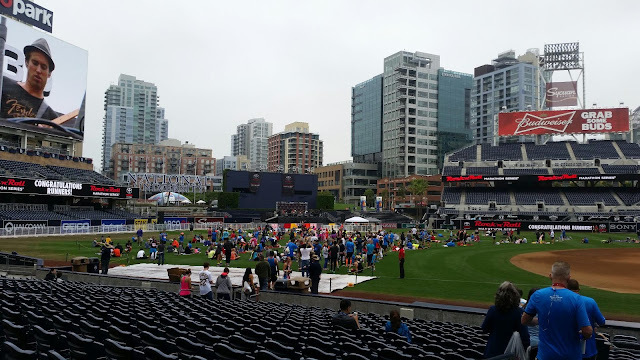 As I was waiting for everyone to join me at Petco Park, I was enjoying the view and free concert. San Diego is pretty awesome! I have to pinch myself to remind myself how lucky I am to live here. We all had such a great time. We earned our bottomless mimosas for brunch! awesome on meeting Meb! looks like you had a great race! 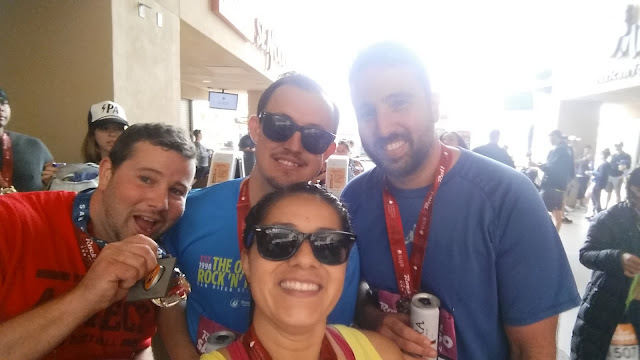 Yay for rocking the race! !